I’m going to occasionally write short pieces on brief and sometimes unexpected encounters, of a religious or spiritual nature, that I’ve experienced over the course of what has turned out to be an unexpectedly long life. I was skeptical. Andy, our Mexican American buddy, was sometimes given to exaggeration, especially in regard to spiritual matters. The image of a 144 year old woman, a Bruja or witch, ensconced on a dolly struck me as farfetched. Andy and my brother Paul were renting a small boxy concrete room that sat atop the corner of a fortress-like home enclosing a large inner courtyard with an impressive drive-through, wooden gate, which I’d nicknamed “Fort Apache.” They had planned the trip long in advance, saving money and getting the necessary paperwork. When I decided on the spur of the moment to come along they were kind enough to let me join them. I had recently resolved to give away everything and become a homeless wanderer. A trip to Mexico seemed like a good start to life “on the road.” Naturally I was without much in the way of money, so I slept in the car Andy had purchased especially for the trip — a sweet, dark green and black, ’47 Chevy sedan. As we drove through the check point the officer stopped us, gesticulated towards me and spoke loudly in rapid Spanish, which Andy translated. “He says that for YOU they want $10.” I guessed that was because of my long hair and full beard — still a rarity outside of San Francisco. Andy and Paul had both cut their hair before embarking. After a few nights in Oaxaca, sleeping in the wide back seat of the Chevy, I was awakened by rapping on the window above me. It was one of the comically attired local policemen, who wore elaborate uniforms with epaulets and ribbons reminiscent of turn-of-the-century European officers. I sat bolt upright, fearful of what would be my punishment for sleeping in a parked car. The officer pointed to the lock button on the windowsill of the front door. I complied by lifting it to the unlocked position. He opened the door, put his nightstick on the floor, lay down on the front seat, and promptly went to sleep. I guess I should have been relieved to have the law on my side, so to speak, but not only did he snore fitfully, he farted mightily, until the whole car reeked of recycled beans. 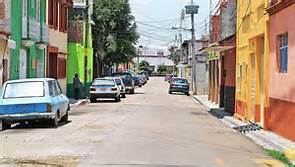 One morning I wandered away from the main part of town, along the dusty streets of the surrounding barrio. I reveled in the beauty of brightly colored adobe buildings fading in the southern sun. Walking alone in such unfamiliar surroundings brought me completely into the present, where I felt wonderfully open and alive. At a wide intersection I stood on the corner pondering which direction to go in next, when suddenly, on the opposite side of the street a young man appeared wheeling a dolly. Near the ground on a small platform in front of the wheels sat a wizened old woman whose legs were folded flat together and covered by a shawl or thin blanket. Except for a remarkable life-force that emanated from her she looked to be well over a hundred years old. The young man and his unusual cargo stopped abruptly at the corner. As I gazed at them across the expanse of dusty street, the old woman smiled, put her thumb and forefinger together, and gently shook a gnarled hand in my direction — a gesture like a grandmother would make leaning over a crib to squeeze the cheek of a baby. I was instantly overcome by a jolt of overpowering love, a love almost sexual in its blissful intensity, unlike anything I’d ever experienced. In a haze of blinding light I staggered off down the street. *Shaktipat or Śaktipāta (Sanskrit, from shakti – “(psychic) energy” – and pāta, “to fall”) refers in Hinduism to the conferring of spiritual “energy” upon one person by another. Shaktipat can be transmitted with a sacred word or mantra, or by a look, thought or touch – the last usually to the ajna chakra or third eye of the recipient. Saktipat is considered an act of grace (anugraha) on the part of the guru or the divine. It cannot be imposed by force, nor can a receiver make it happen. The very consciousness of the god or guru is held to enter into the Self of the disciple, constituting an initiation into the school or the spiritual family (kula) of the guru. It is held that Shaktipat can be transmitted in person or at a distance. Senior Dharma Teacher Zenkei Blanche Hartman served as an abbess at San Francisco Zen Center — one of the first women to lead a Zen training temple outside of Asia. When she died in 2016 at the age of 90 I wrote a short remembrance of my encounter with her several years earlier. I had decided to take advantage of the Zen Center’s generous open-ended offer for anyone to do dokusan with a teacher at their City Center. Since Blanche Hartman was the only one there older than myself and I’d never actually met her face to face, I signed up for an interview with her. Because our meeting was during the center’s 5:30 morning zazen (meditation) I drove down to Berkeley the day before and stayed at my brother’s overnight. With the first morning light I crossed the Bay Bridge to the Zen Center in the lower Haight, a lovely old brick building designed by Julia Morgan for a Jewish women’s home, with a large ballroom in the basement — an ideal space for a Zendo (meditation hall). I went up the steps and knocked on the massive door. A young woman in black robes answered and directed me to a small room on the corner of the top floor. After the ritual bell ringing and bows I folded myself into the half lotus and sat facing Blanche Hartman a foot or two in front of me. She was an impressive figure. Even in her eighties she sat ramrod straight in perfect meditation posture, brown robes precisely arranged and her gaze direct and relaxed. “This time is for you,” she said. After a few minutes of silence we launched into an animated discussion. She more than held up her end of it, with stories of friends and Zen Center episodes from the past. When two people are one in their innermost heart, even though they meet for the first time, it’s like old friends getting together. 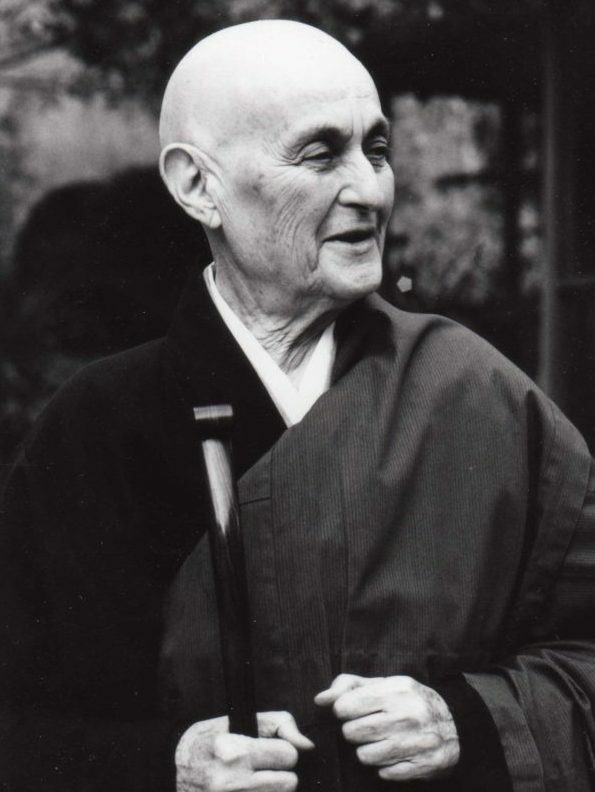 When she said that what made Suzuki Roshi so special was his ability to see the Buddha Mind in everyone I nodded in earnest agreement. She also described how Richard Baker, the disgraced successor to Suzuki, was a marvelously talented teacher with a unique ability to bring out the truth of zen in personal encounters. I related one of my favorite metaphors for meditation. When I was a kid my parents used to take me to Playland by the Beach in San Francisco. In the funhouse, past the wonderful life-size wooden figure of the a fat lady rocking back in forth in gales of laughter, there was a huge round hardwood wheel mounted on the floor, surrounded by low padded walls. At the sound of a bell everyone entered and scrambled to sit down on the big wheel, cramming together with backs towards the center. At the sound of another bell the wheel started to slowly turn. As it picked up speed people on the outer edges of the crowd started to slide off, flying into the padded walls. Finally, as the wheel was turning faster, only one person, who had managed to find the exact center, was left spinning there. Eventually even they could not maintain a perfect balance and were pulled off by centrifugal force. Since we were both quite old, we also talked of death at length. I told her of my parents who had both died recently in their nineties, within a few hours of each other. Blanche said that she was with a close friend who had suddenly put her hand to her head and complained of a sharp pain there. “A couple weeks later she died of a brain tumor. Just like that,” Blanche said, snapping her fingers. We must have rambled on for an hour before she suddenly remembered there were others waiting to see her. We quickly bowed and I went out the way I’d come. When I got back to Berkeley, I lay down for a brief nap. Soft light streaming in through a lace curtain on a tall window triggered something deep within me, one of those sublime “moments” that I think anyone who loves meditation occasionally experiences. It felt like a continuation of my meeting with Blanche Hartman. 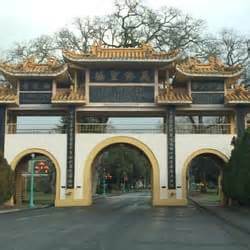 I’d heard that a Chinese zen master from San Francisco, Hsuan Hua and his followers, had bought the old Mendocino State Asylum for the Insane and were transforming it into a Buddhist Monastery. Sensing that fate was somehow at work I drove right on through the gate and parked in front of what appeared to be the office. I walked inside and asked the young Chinese fellow behind the counter if there was a schedule for zazen (meditation). He didn’t speak English, and I don’t know a word of Chinese, but after some pantomime he suddenly grasped what I was referring to and excitedly pointed down a street and almost shouted “Tathagata,” several times. The narrow streets were all marked by faux street signs with names like “Proper Work Avenue” and “Wisdom Way.” I finally found “Tathagata Boulevard,” which led to “Tathagata Hall,” an old, weathered, unpainted grey stucco building with protruding roof tiles that gave it an oriental character. It was an overcast winter day and the leafless trees and stark bare courtyard created a mood that was strangely beautiful and silent. I imagined I was a traveling monk who had just arrived at an ancient Chinese monastery. When no one answered my tentative knock on the door I opened it and walked slowly down a long musty corridor lined with empty cells behind steel bars. 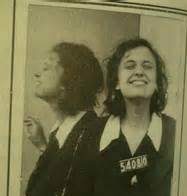 I was to learn that the solitary cells had formally housed deranged mass-murderers and the most dangerous of the state’s criminally insane. Without much remodeling the tiny cells were now home to severely ascetic Buddhist monks of the Chinese “Chan” tradition. A large restroom along the hallway appeared to have been completely unchanged from former times, the old round fixtures, heavy porcelain sinks and urinals, replete with ancient odors and stains, were profoundly weighty and substantial. Built with the sturdy materials and workmanship of an earlier time, everything in the old structure, from high ceilings to yellowing walls and dark wood, was weathered and worn by the passing of a multitude of insane asylum inmates — whose ghostly tormented souls seemed to float in and out of the corners of my mind like peripheral visions. Finally I stumbled into the meditation hall, a long narrow room with an extremely high ceiling and skylights from which rays of light drifted down. Meditating monks lined both sides of the room facing one another across a wooden floor. They were all Chinese except for one Caucasian who came to my rescue and escorted me to a sitting cushion near the door. I quickly settled into the palpable stillness that pervaded the room. I noticed that the monks had old pink or blue pastel blankets over their legs or around their shoulders that looked to be holdovers from the insane asylum days. Many of them were nodding and falling asleep. I was to learn later that this was the final part of their annual three week retreat during which they rose at 2:30 in the morning after only a few hours of sleep, usually taken sitting up in the full lotus. They were encouraged to undertake austere vows such as never to lay down. A few of them walked from the Mexican boarder to Canada while executing a full prostration with every third step, emulating their master who had crossed all of China in the same manner. There was no bowing, chanting or other ritual in the meditation hall that afternoon. Between silent sittings we walked at a brisk pace around the room several times. For awhile a slender old monk in faded robes stood on a platform at the front of the room and gave a solemn talk in Chinese. Since I couldn’t understand what he was saying, I concentrated on what he was communicating non-verbally — an exercise that I found most interesting. When it began to get dark I felt duty calling me to finish my errands for the Art Center. After bowing to my motionless and unresponsive hosts I exited and slowly walked back to my car, savoring the moment. I planned on returning to attend all of their next retreat the following year, during the holidays in December and January, but I never did. I’ve heard they’ve spruced up the buildings and grounds considerably since then, including opening a vegetarian restaurant. The large campus serves and is supported by the Chinese lay community in San Francisco. It’s said there really is ten thousand statues of the Buddha there and many colorful rituals and ceremonies are conducted. I suspect the monks in the recesses of the Tathagata Hall are only a small, but essential part of what goes on there.